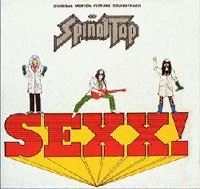 Spinal Tap A to Zed : SEXX! SEXX! : Motion picture soundtrack that was to be done by Tap. The project fell apart, and all that remains is a proposed album cover included on the CD-ROM and laser disc reissues of "This is Spinal Tap."